Special dance and cowboy themed programs. Using our 20 years experience in private party performance, we've put together two special entertainment packages! We regularly provide contra dancing as either an addition to our normal show, or as the main event at many of our performances. Our contra dances are especially popular at weddings. 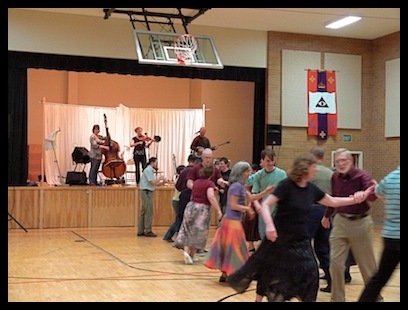 Contra dance is a very beginner friendly form of group dance that you can think of as a traditional version of "Line Dancing" or "Square Dancing" (and is much more fun for the participants than either of these). We have a couple of great callers who are very good at teaching the dances and getting folks out on the floor participating in the event. For those worried about the “non-dancers” in your guest list, nothing more than a brisk walk is required and our dance callers walk everyone through each dance before they begin. It's fun for all ages and is danced to live fiddle and banjo music from the American and Celtic traditions. Blue Sage can provide background music before and during dinner while the guests socialize. After dinner our dance caller gathers the guests together for an authentic "Barn Dance”. No previous dance experience or talent is required! Consider closing your special event with a delightful evening dancing to a live band playing traditional Fiddle/Banjo tunes; those who don’t want to dance will still enjoy socializing to a background of lively fiddle/banjo music. Blue Sage provides background music before and during dinner while the guests socialize. 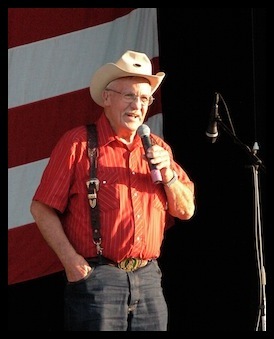 We then bring in a world class cowboy poet for a short after dinner show. Blue Sage then returns to play a few tunes while the guests finish socializing. Combining the Blue Sage Trio with a cowboy poet provides more entertainment and keeps the costs down. A full evening of music plus a variety act for the price of a quartet alone!